Liana Kaneli, image provided by the author. Two weeks ago the Greek government announced a new round of austerity measures targeted primarily at civil servants, wage earners, retirees, and low middle class families. The picture above shows Liana Kaneli, a member of the Greek Communist Party, addressing her fellow MPs in the Greek Parliament during that same week (you can see a video of her speaking here). As she approached the podium carrying a plastic grocery bag, she requested that her entire speech be recorded to the Parliamentary Record (Praktika) “because she is a woman”. It is not clear if the MP meant that she is bringing in groceries to the Parliament floor because she is a woman, or because she is a woman she might otherwise be ignored if her speech is not recorded to the Parliamentary Record. Then she proceeded to remove a loaf of bread and a plastic bottle of milk and invited the audience’s attention with an expression commonly used in farmers markets by sellers trying to catch the attention of the shopping housewives. 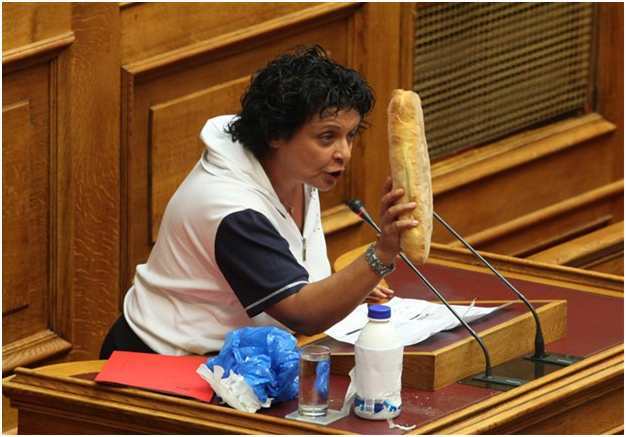 The MP wanted to make the point that these items are becoming increasingly unaffordable for large sections of the populace, however she was interrupted by the Chair of the Parliament and was told that food on the podium did not constitute imagery that was appropriate for the Greek Parliament, “otherwise I could bring some chickens in here and someone else can bring some sheep” said the Chairman. The MP sarcastically apologized for offending the dignity of the Parliament and for ruining the “décor” and proceeded to submit the food items to the Parliamentary Record. Amidst protests from other MPs that physical objects may not be submitted to the Parliamentary Record, Kaneli removed the offending food items from the podium and after concluding her speech she walked away. The next day the Chairman of the Parliament issued a statement condemning the event as “political theater”, while the Greek Communist Party issued its own announcement supporting its member’s actions and, citing Bertolt Brecht, noted that “those who are in high places have always found talking about food to be demeaning”. Perhaps Greek gender politics played into the fact that it was a female MP who chose to criticize government policy in the language of daily food shopping, yet heated discussions like these concerning the affordability of every day staples help us understand the serious economic hardships that many Greeks are facing. It is not surprising, therefore, that references to food are common in Greek public discourse about the crisis. When it first became clear, 2 years ago, that the Greek State was essentially broke, food was widely used as a metaphor in popular calls demanding accountability. The question of “Who ate the money” was raised by people and politicians alike. While eating money refers to irresponsible and wasteful spending of money, popular demands to know who it was that “ate the money” were essentially calls for justice. Politicians and state functionaries were called out for their mismanagement of the resources of the Greek economy. David Sutton in “Eating in Times of Financial Crisis” discusses the use of food as a theme in making sense of the debt crisis. He points out that although the economic crisis was not framed always in terms of food issues, food as a theme is becoming increasingly central in making sense and navigating the new economic realities in Greece. The incident in the Greek Parliament last week shows the ability of food to embody value (a practical way to assess the rising cost of living) as well as values. The heated exchange between the MP and the Chairman was brought about by the polluting presence of food in a space in which political philosophies are debated and bills are voted on. During this exchange which lasted less than 3 minutes we witness, among other things, the power of food to embody meaning, provoke conflict, offend sensitivities, and express ideas about class and gender. Ultimately, this power is derived from the ability of food to bring together diverse cultural domains of experience and practice. The associative powers of food can also help us understand another prominent use of food in the unfolding of the debt crisis. This past year thousands of Greeks have taken to the streets, following the example of the Indignados movement in Spain. They have used food as a tool, a physical object to be expelled en masse in public marches, protestations, and strikes usually against the police and politicians. The food most commonly used as a projectile is a traditional variety of Greek strained yogurt made from sheep’s milk that bears strong associations with rural lifestyles and values. When the Chairman wanted to mock MP Kaneli, he made reference to rurality through the not very subtle suggestion of bringing livestock into parliament. It is interesting to consider why references to rurality make up a key feature of popular protests as well. In my next post I’ll suggest some of the ways that exploring yoghurt as political protest provides provocative angles on some of the sources of discontent in contemporary Greece. Gender and food figures: the gourmet chef, the housewife, the family, the writer, the food critic, Julia Child, Martha Stewart, Michael Pollan, Mark Bitman, Rachel Ray, Iron Chefs, Top Chefs, etc. Gendered food spaces: The kitchen, the grocery store, the dining room, the farmers market, the café, the restaurant, etc. Gendered representations of food: in literature, in film, in television, in magazines, in ephemera, in metaphor, etc. Preconstituted panels will not be considered.